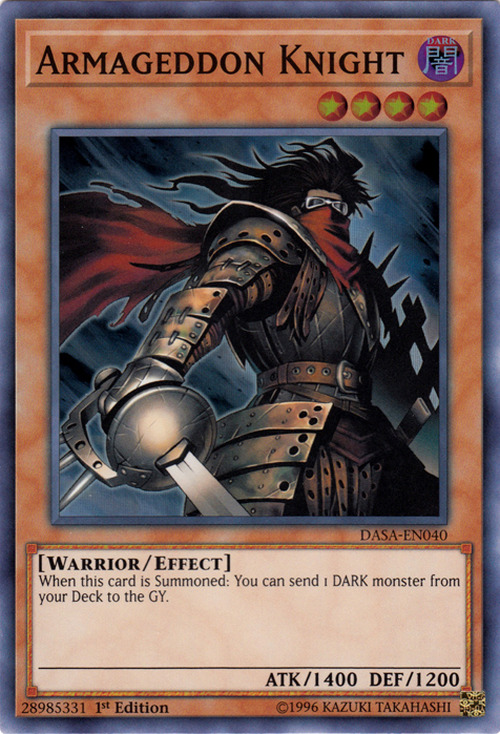 When this card is Summoned: You can send 1 DARK monster from your Deck to the GY. This card's name alludes to Armageddon. This monster appears in the artwork of Armageddon Designator. This card is the first Attribute Knight to be Limited. If "Armageddon Knight" is Special Summoned during the Damage Step, you can activate his effect to send a DARK monster from your deck to the Graveyard. : When "Armageddon Knight" is Special Summoned during the Damage Step, can its effect be activated? At the time of "Destiny Hero - Malicious" being sent to the Graveyard by the effect of "Foolish Burial"/"Armageddon Knight"/etc, the Turn Player cannot use Priority to activate the Ignition Effect of "Destiny Hero - Malicious". If the Turn Player passes Priority and does not activate a Spell Speed 2+ effect, then the opponent can activate the effect of "D.D. Crow" before the Turn Player can activate the effect of "Destiny Hero - Malicious". : At the time of a monster being sent to the Graveyard by the effect of "Armageddon Knight", can the Ignition Effect of a monster be activated?